Renovated in the style of the Republic of China, Chongqing Travelling With Hostel (Jiefangbei Branch) is a 1-minute walk from Eighteen Ladder. The clean and simply designed hostel offers a tour desk with ticket service and free Wi-Fi in all areas. Chongqing Travelling With Hostel is a 2-minute walk from the Jiaochangkou metro station on line 1 and a 4-minute drive from Chongqing People's Liberation Monument. Chongqing Railway Station and Hongyadong are reachable in 10 minutes' car ride from the hotel. All rooms come with air conditioning and a bathroom with shower facilities. Some rooms have a flat-screen TV and an electric kettle. Guests can relax to have a game of Billiards after a long journey. The hostel provides dry cleaning and laundry services at an extra charge. Staff can assist with luggage storage service. There is shared lounge area where you could social and relax while enjoying a cup of coffee. The on-site restaurant serves a variety of local dishes and international flavours. Alternatively, guests can enjoy refreshing beverages at the bar. Guests will be contacted by the hotel for pre-payment. Please follow the instructions provided by the hotel. Room comes with 3 single beds. Room comes with a single bed, a desk and a private bathroom with free toiletries and a shower. The room comes with a queen bed, a working desk, a cable TV and a private bathroom. 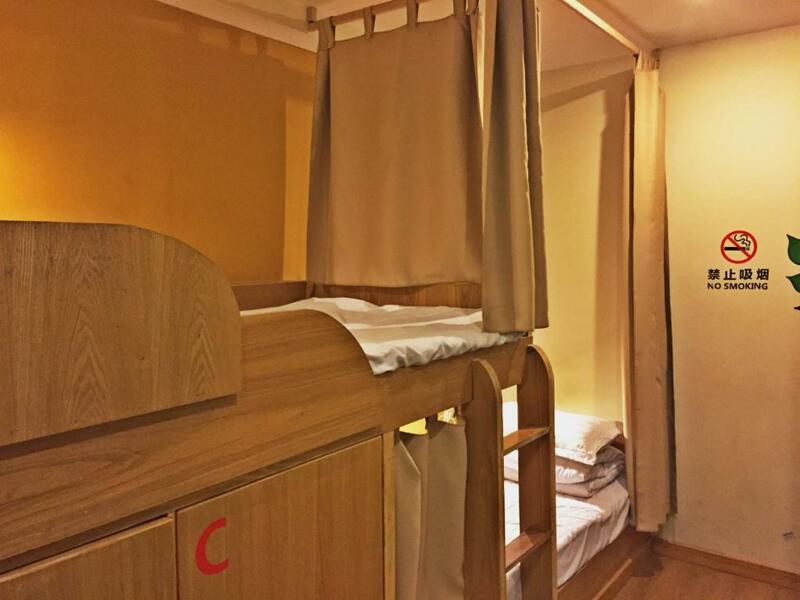 This bed in dormitory features a tumble dryer , air conditioning and dining area. Please note that room rate is for 1 bed only. The 18-square-metre quadruple room comes with air conditioning. This double room features a dining area, electric kettle and air conditioning. This twin room has a electric kettle, dining area and flat-screen TV. Public parking is possible on site (reservation is not needed) and costs CNY 3 per hour. Your experiences are very helpful to other travellers. On a scale of 1-5, rate the equipment you have used during your stay at the hotel Chongqing Travelling With Hostel (Jiefangbei Branch) and express your opinion. Your opinion is important! I certify that this review is based on my own experience and is my genuine opinion of this hotel (Chongqing Travelling With Hostel (Jiefangbei Branch)), and that I have no personal or business relationship with this establishment, and have not been offered any incentive or payment originating from the establishment to write this review.